Well, a dramatic finish at Dens Park sees Celtic move 10 points clear at the top of the Premiership, courtesy of Odsonne Edouard's 96th minute winner. Remember, Sportscene will be shown on the new BBC Scotland channel at 19:15 tonight. And we'll have highlights of all the weekend's games on our site later. Thanks for your company. enjoy the rest of your weekend. 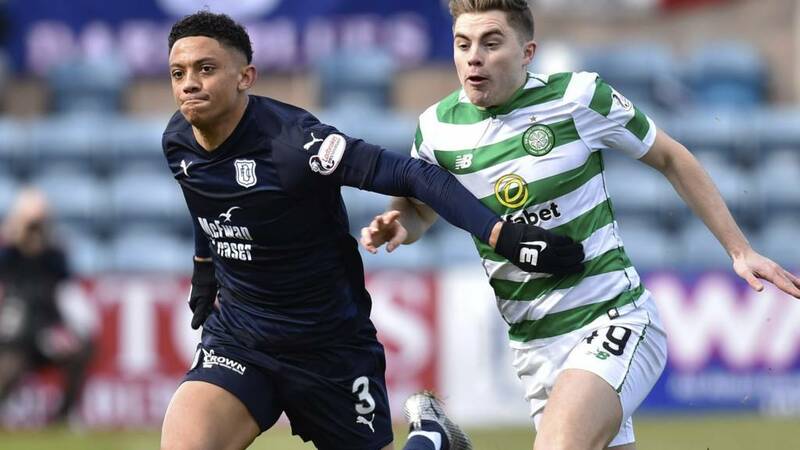 "The most important thing now for Celtic is to get the results and get themselves over the line [for the Premiership title] and they also have a Scottish Cup semi-final to look forward to. "Today, Celtic looked like they lacked a bit of imagination... but Neil Lennon has got to get results, and that's what he's getting." How do you deal with a 96th minute winner? The ecstacy and agony was on display at Dens Park. Just a reminder, Sportscene will be on the new BBC Scotland channel for an extended show, starting at 1915! Plenty of goals and talking points for Jonathan and the team to get their teeth into. Dundee manager Jim McIntyre told Sportsound: “It was a real surprise. “I asked the fourth official, John Beaton, and he explain the referee felt there were three head knocks as well as the substitutes. “We never seem to get six minutes added on when we are looking for it. I found it strange to say the least. “I don’t want to make too much of that. In the last two minutes we had a great opportunity and we have to do better. Celtic break from that and score. Celtic manager Neil Lennon: "I think I've aged about three years! Patience was the key,. but we left it pretty late again. "It's the third game out of four: you think about Kilmarnock, Hearts and now today. But they keep going. "I didn't like the way we played today at times but that's not for the here and now. It's a brilliant win, a significant win and I think we got what we deserved." "That one split-second of concentration cost Dundee. I think the biggest frustration for Jim McIntyre will be the six minutes added that the fourth official put up. "That gave Celtic a lift; gave their fans a lift and you could hear the boos ringing out from the Dundee fans. "Also, from the [Dundee] players' point of view, they've given everything - and the next minute they see six minutes going up: they think 'oh, come on!'" Odsonne Edouard's late, late winner sees Celtic move 10 points clear a the top of the Premiership heading into the international break. What a finish. Celtic looked to have run out of steam and ideas until a spearing run from James Forrest set up Odsonne Edouard to fire home the winner and send Celtic 10 points clear at the top of the Premiership. Incredible scenes. Celtic have struggled throughout the second half but a moment of magic sees James Forrest play in Odsonne Edouard and the Frenchman is coolness personified to slot home what could prove to be a late, late winner. Neil Lennon is out of the dugout and off and running down the touchline. The visitors force a corner, but to borrow a Blackadder saying, they've been like an asthmatic ant carrying some heavy shopping. Precious little for Dundee boss Jim McIntyre to worry about. Six minutes of added time at Dens Park. Scott Brown sends a long diagonal into the box but there are no takers: Celtic lacking a cutting edge and creativity as we head towards the 90-minute mark. Celtic running out of ideas? Jonny Hayes, wide on the left, sends a cross straight into the first man of the Dundee defence. The hosts have handled pretty much everything Celtic have offered in the second half, which admittedly hasn't amounted to much. Six minutes plus added time remaining. Celtic goalkeeper Scott Bain reacts well to mop up the danger after a slack backpass from Jonny Hayes. The visitors have been sluggish in this second half. James Forrest sends a fierce effort whistling wide of goal, but it was deflected by a Dundee boot. Corner for Celtic. Cleared by Dundee who have found the majority of Celtic's crosses into the box food and drink. Defender Jeremy Toljan is off, replaced by Timothy Weah. What chances of a late winner for either side?